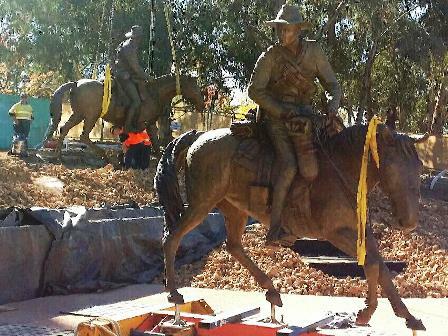 The photos below tell the story of the 1.5 life size horse and rider sculptures being cast in bronze in Melbourne, the ground works in Canberra prepared then the statues loaded ready for shipment. 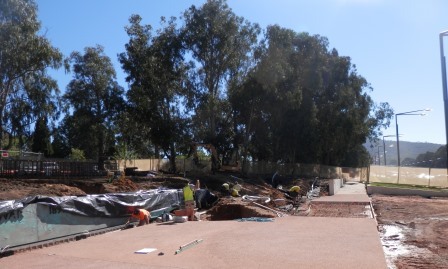 Two large, copper clad walls emerge from the surrounding landscape to define the memorial space. 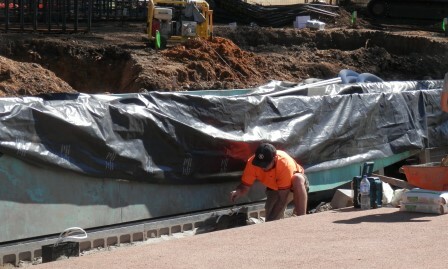 The walls are aligned to the dominant parallel geometry of Anzac Parade to create a simple yet strong framing of the memorial. CLICK HERE to download Wall Specifications. The different heights of the walls reflect their different functions; the higher back wall is a backdrop to the bronze sculptures, and the lower front wall frames the ceremonial forecourt while allowing interpretation to be read along its top. The faces of each wall will be a composite of several large, hand-forged copper sheets, joined with rivets and finished in a green copper patina. On top of the lower front copper wall will be 9 bronze replica journals showing extracts of the letters of No128 Private F H Booth 2nd Victorian Mounted Rifles, giving continuous typical picture of a soldier's 12 months of service. We are very excited to be able to include excerpts of letters sent home by Private Frederick Harper Booth, that tell the personal story of the excitement of arriving in Cape Town, moving out to the front, fighting, disgruntlement, hunger, exhaustion, and the necessity for the scorched earth policy and rounding up of women and children into concentration camps. These have been archived and made available for use in the Boer War Memorial by his grandchildren, including author Peter Fitzsimons. Read more about the story of F H Booth HERE. The bay is full of transports, about 50 large steamers and as many more sailors. The Warrigal arrived about 4 hours before us. There is a large hospital ship lying close to us. We leave camp tomorrow morning. We were issued with the new magazine rifles today-also 100 rounds of ammunition 50 in our bandolier and 50 in our pouch, all carried on our backs. We have now been on the march for 12 days and are within 30 miles of our destination. It is very hard on the march - rations reduced. No tent and only 10 lbs per man allowed on the wagons. We kill our meat and commandeer what horse feed we can. The horses are being badly fed. The 2nd Contingent leads the way. We travel about 10 to 15 miles a day. It is a grand sight to see the procession of troops: battery after battery of artillery ammunition columns; regiment after regiment of infantry. The Maxim guns, stretcher bearers, water carts, ambulance wagons. Then the lancers and mounted infantry. Then the engineers and then follow the wagons, mule wagons and bullock wagons. There are 7000 troops in the column which is several miles in length. We have had a very hard and tedious march of 16 days. We are now having to rest on account of our horses which are knocked up. Many a time we are so hungry that we eat all our rations for breakfast and take the chance of buying anything for the other meals. At the Sand River we had a terrible fight. 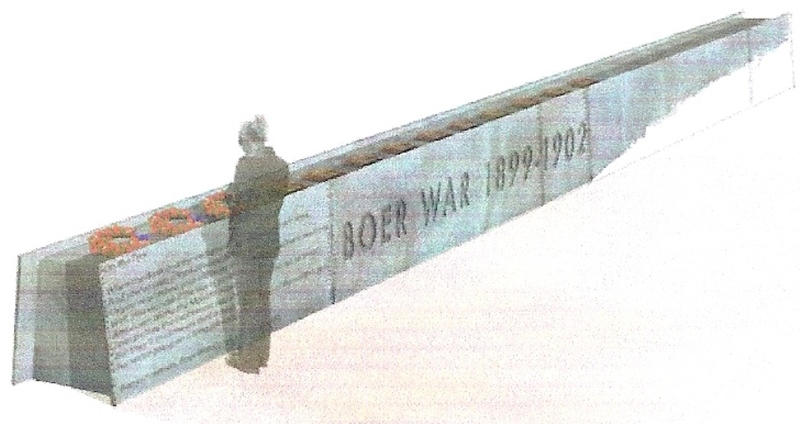 The Boers had blown up the bridge and when we crossed they opened fire. The Boers have some very good guns and they make good use of them. We had to fight all day. It was a terrible strain when the shells are screaming amongst you and burst. Even amongst all the fire we keep a fairly good line with our proper interval. We ride company behind company and if we bunched up at all there would be terrible slaughter, everyone admits how terrible artillery fire is, yet no one attempts to move till he is told and no matter how good your horse you never move to get cover any quicker than the regiment such is British discipline. We took a kopje (hill) overlooking the Rand and our company was told to seize the Station Master, cut the telegraph line and tear up the railway. There were two trains with full steam up at the next station ready to carry the Boers away. If they attempted to run the gauntlet we had instructions to shoot the engine driver. Such a lot of our fellows are sick. We have had a terrible hard time of it. Our horses have been living on mealies and sometimes nothing at all. 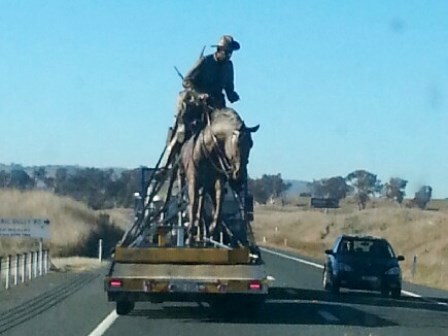 My horse which has carried me ever since I left Melbourne is now completely done and the colonel turned her adrift. I have now got a Boer pony. The Boers made a desperate resistance at Pretoria. They had a splendid position and stuck to it all day. We got our big guns to work and shelled them. Our guns are wonderful, we call them Weary Willies, it takes a span of 40 bullocks to draw one. Our scouts passed close to the plantation and could not see any Boers and they never attempted to fire on the scouts. Thinking all was clear we advanced up to the plantation. The Boers jumped up and opened a terrific fire on us. The four men nearest them were cut off and taken prisoners. The rest of us had great luck to get away. We could get no cover and had to ride right out of range. They are sending home the Imperial volunteers and retaining us. Since the others left we have been remounted and have been on the warpath again. They mount us on Argentine broncos while the English society pets get beautiful English and Australian horses. These Argentine broncos have no heart, absolutely no brains, and are knocked up after a couple of days' march. A man practically throws his life away to go into action on a bronco and the Imperial Government ought to be ashamed of themselves. We are bringing all the women and children in from the farms. We only let them bring their bedding and clothing. We give them no warning, just ride up to the house with a wagon and tell them to pack up. They lock up their houses and leave all their goods behind. The burning of the farms causes a heart-rending scene but we are quite justified in doing it. We burn all crops and food-stuffs. It will take hard measures to subdue the Boer. Not until the Boers are either killed or taken prisoners will hostilities cease. Kitchener is the only man who will finish the war.